I announced this blog series last week and I'm so excited to dive right in! I have lots of ideas for very specific topics but I don't want to get ahead of myself, so let's start at the very beginning! So you have a great idea for a handmade business/podcast/blog/craft workshop/whatever. Now what? Yep, that's it. Just start! If there's one thing we all have in common it's that we all have to start somewhere. Usually that somewhere isn't glamorous or perfect or exciting, but it's somewhere. And that's all that matters. I'll use my experience as an example: Back in 2007 I taught myself how to screen print and started making greeting cards. I thought, hey, people might want to buy these! Back then my plan back then was never to start a business, it was just to have fun and make a little money to support my new hobby. But either way, hobby or business, I had to get started! I opened an Etsy shop, snapped a couple pictures of my new cards, wrote a little description, guessed at a price, and clicked publish on the listing. And there it was! My creation was out in the world for people to see! So exciting! My first card sold within a couple of days and I was officially hooked, excited and ready to work on more products and designs and get other stuff listed. Sounds great, right? Well, it wasn't as perfect as it sounded. My photos were bad. Terrible, even. I only had 2 products to choose from. I didn't know what my brand was, at all. I didn't have a logo. My prices were too low. Even though all of these things were "wrong" at the time, it's what got me started and gave me the energy to continue. And guess what? I learned everything else along the way! I learned how to take better photos, effectively price my products, focus my brand, and diversify my product line in these past 7 years of doing business. Honestly if I thought I had to have all of those things nailed down when I wrote my first listing I probably would've been too overwhelmed to ever start. Here are my do's and don'ts for helping you to just get started with a new creative endeavor. Outline what needs to be done. What are the steps that will get you to your goal? Focus on the necessary ones, only. Give yourself a deadline and stick to it! Enlist a friend to help hold you accountable. Tell someone about your goals and ask them to check in with you about them. It'll be harder to procrastinate if you know someone's expecting you to deliver on your promises. Quit thinking and start doing! Don't get stuck with analysis paralysis. Don't get distracted by the details. Don't feel like everything needs to be perfect. Don't spend hours on end searching Pinterest. 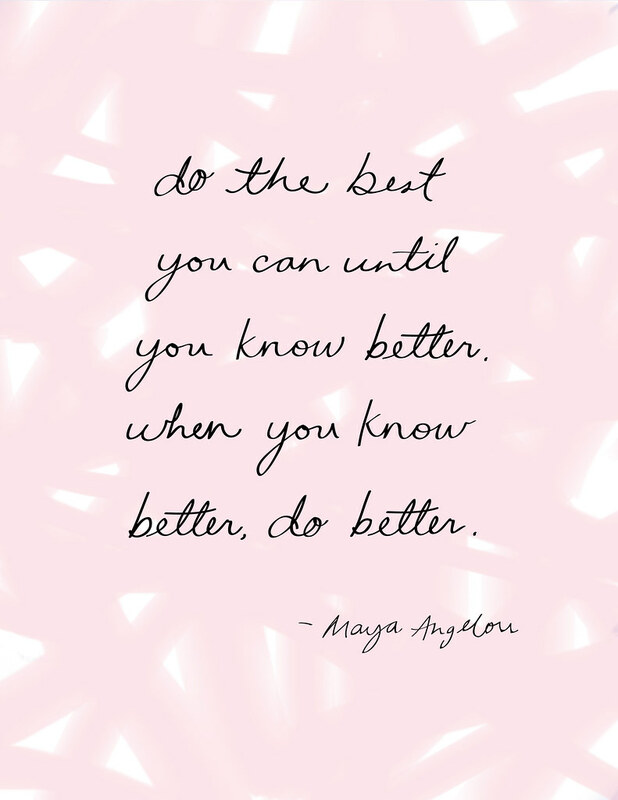 I love this quote by Maya Angelou and think it's so fitting for starting something new, doing your best, and learning from it! 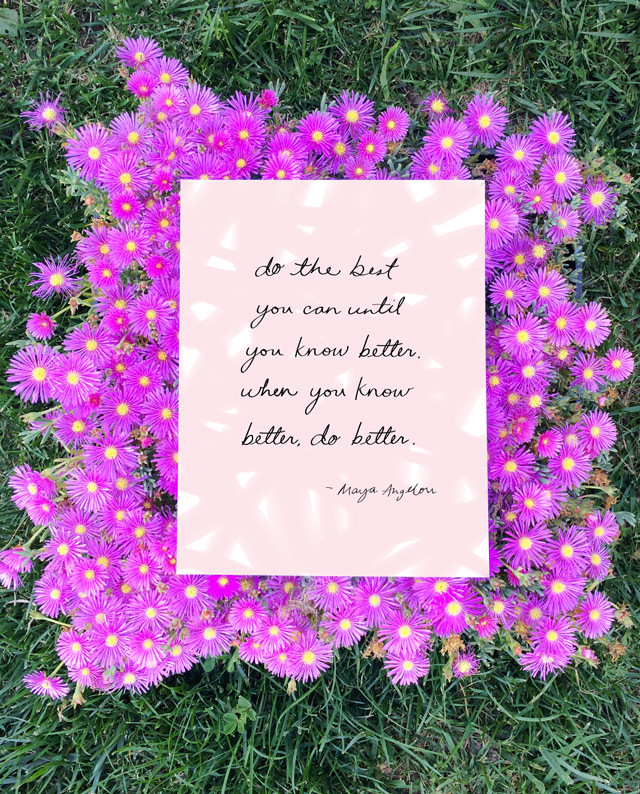 I liked it so much I made a hand lettered printable for you! Download it right here if you'd like. I'll continue this series of blog post with other topics, but please let me know if there's something specific you'd like to see covered here. Just leave a comment or send me an email. :) And have a great weekend!